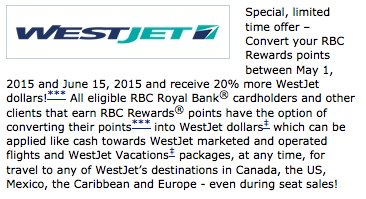 On Friday we saw the return of the 20% bonus for transferring RBC Rewards Points to WestJet Rewards for Avion Cardholders. This is the exact same promo that was around in November 2014 but is lower than that seen at about this time last year of 25%. While not as lucrative as the 50% Transfer Bonus we see for British Airways that should be coming up in June or July this offer can really make sense for a lot of Canadians who have no interest in what the British Airways Executive Club program can provide. With this offer you'll get the bonus and in return you can redeem those WestJet Dollars on any WestJet flight and it can even be a partial redemption unlike most FFPs which require you to have the full amount of miles at time of redemption. 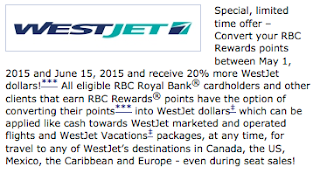 With this promo you'll get 1.2 WestJet Dollars for every $100 RBC Rewards Points converted. Essentially a 1.2% return on your spending which isn't great but say you only have 10,000 RBC Rewards Points right now, you can't redeem that for more than a value of more than 1% with RBC Rewards so you would get more value out of the WestJet transfer. This really only makes sense if you want to save on some upcoming travel with WestJet however. If you don't have travel planned in the next few months your best bet is to hold onto to those RBC Rewards Points for redemption via their Avion Award chart or conversion to British Airways. Find all the details on this promotion here.